Voltaire goes beyond traditional jury research and litigation support with patent-pending technology that gives your team the competitive edge. Upload basic identification information and automatically get access to billions of public, social and behavioral records – eliminating hours of exhaustive human research and increasing your level of accuracy and detail. Discover hidden bias and spot potential issues before they happen. Voltaire takes the information uncovered during research and converts it into detailed Risks and Factors that go below the surface, utilizing behavioral and psycholinguistic analysis to help your team make better decisions. Find out at-a-glance what interests your jurors. Eliminate hours of online research and analysis with our easy-to-use, yet powerful A.I. 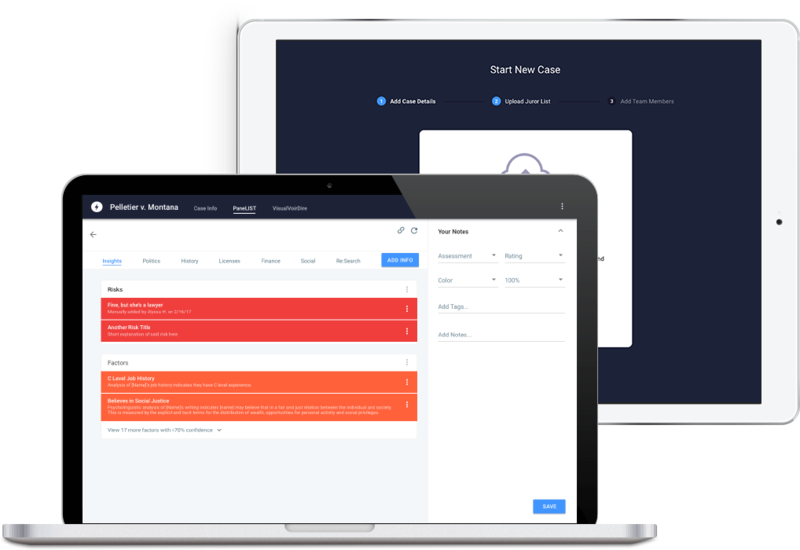 Instantly identify critical risks & biases about a juror before questioning begins. Recognize & avoid potential problems before they affect your trial. Summarize data from a vast array of web sources. Make informed decisions based on real world characteristics, traits and accomplishments. Collaborate and analyze like never before with Voltaire. See how our software can help create better outcomes in trial. Harness the power of artificial intelligence and machine learning to generate insights fast. Our technology gives allows you to access more information than you ever thought possible, in a fraction of the time. Harness the power of artificial intelligence and machine learning to generate insights fast. Our technology allows you to access more information than you ever thought possible, in a fraction of the time. Jury research has never been easier. Our proprietary search techniques go below the surface and gain access to information from a variety of sources. Our patent-pending algorithms analyze information from billions of data points and provide you with actionable intelligence on target individuals. View a wealth of data, including our Risks, Factors and Insights, organized on one easy to read report. Condense hundreds of data points on each individual into a concise dossier that gives you a more complete story. Time is money. When you are performing case or jury research, you want accurate results fast and Voltaire provides both. Our industry leading technology gets you the right information on the right individual when you need it. Anybody can gather data. Anyone can put the data together in a report. What sets Voltaire apart from every other Voir Dire app? The fact that it tells you what to do with the data. What does the personal and social media data mean? How will the information garnered predict deliberation behavior? Voltaire has helped me overcome the all too common frustration of getting the venire list the day before, or even the day of trial. With Voltaire, I can develop rich social-psychological profiles of potential jurors, in a matter of hours. Voltaire really helps me with stealth jurors or silent jurors, who may be incapable of giving either party a fair trial. In my mind, Voltaire means fairness, efficiency, and safety. I can't imagine going to trial without using Voltaire. I've used Voltaire in the courtroom twice now, and I'm hooked. With the severe time limitations on Voir Dire, it is sometimes nearly impossible to get all of the information you really need to identify jurors who have a strong bias that could hurt you - Voltaire gives me a head start, and gives me the key information that tells me how the juror thinks, and what she values. Lisa DeCaro Courtroom Performance, Inc.
Ready to see how Voltaire can give you the upper hand?